Our February Newsletter was published and is on line (member section)! We have a safe and beautiful neighborhood. The RPOA is run with the future in mind with excellent planning and maintenance. We have beautiful custom homes and well kept landscape. Thank you neighbors for working so hard to keep this Neighborhood looking great! I want to thank all the board members and volunteers last year for your hard work and contributions to the community. I am looking forward to another productive year serving as your RPOA President and welcome the returning and new board members and committee chairs and members. The Board is committed to our 2019 goals of continuing to improve our community infrastructure, grounds, and facilities; maintaining or increasing property values for our residents; keeping our members informed about neighborhood issues; and being a good steward of Association funds. Communication methods continue to expand including our therapids.org website, Facebook page (The Rapids Neighborhood), email, and newsletters. As Board members, we are representing you, the Rapids Property Owners Association. It is a valuable and rewarding experience to have the opportunity to serve you, our fellow residents, while maintaining a strong sense of community relations and protecting the value of our homes and Association owned assets. Remember that the Board and committee members are community volunteers serving the residents. We are looking for residents interested in serving on committees specifically infrastructure and maintenance (including a chairman), grounds, and covenant compliance. Please contact me or another board member if you are able and willing to assist, volunteer, or provide expertise in these or other areas. Thank you for all the street representatives for your willingness to help share information with your assigned residents. We need all street representatives to contact your street rep coordinator to ensure you have the latest welcome packages and we have your and your residents’ updated information in our database. We are looking forward to a prosperous new year and executing the 2019 neighborhood renovations and improvements approved by the association at our annual meeting in December including the clubhouse window/door replacement, clubhouse exterior maintenance, and Greeneway access walkway. The annual briefing is available on the members only section of the website under newsletters. This brief includes some details on the pool and sidewalks from last summer’s survey many of you participated in online. The board will continuously review and update a multi-year project and maintenance plan. Please provide the committees any ideas or inputs you may have for long-term projects. If any of these are proposed for future ballots and require detailed discussion, a special meeting will be called late summer/early fall to discuss and answer questions prior to ballots being sent to membership. Please contact me or a board member with your concerns and suggestions. Welcome to the many new residents in The Rapids, both on Seton Circle and throughout the area. Please register to view all the website documents and news. After registering you will be authorized to click on the newsletter link on the left hand side of home page and read our newsletter on line. 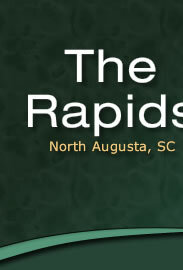 One very informative site you may want to visit is the North Augusta Chamber of commerce. Both old and new Residents might find out the events planned in North Augusta via the Chamber's events calendar. Also our residents are sometimes featured in the Riverfront Magazine if you find the time to take a look. Please remember that our fastest means of communication with you as a resident is by Email. We continually seek to get the email address of all residents with email in our secure Database. If you are new to The Rapids, have changed your email address, or are not on the email Database please submit your email address to Ken Beck (beckkg@att.net) and change it on our website as well. Our email Database is used strictly for crime alerts, emergency notifications and newsletter distribution. Your address will not be given out. We also continue to need occasional volunteers to assist with work projects at the pool, clubhouse, at the entrance and other areas. We welcome all of you and hope you will enjoy the beautiful neighborhood and help us keep it one of the most desirable areas in North Augusta. Be sure to review the covenants for your area of the Rapids to better understand the guidelines that keep our Neighborhood safe and beautiful.